MTNL (Mahanagar Telephone Nigam Limited) is Government owned Internet Service Provider who is currently providing high-speed broadband service in Delhi and Mumbai. They offer unlimited broadband plans for their customers in these two metro cities. This tutorial explains how to configure MTNL ADSL modem manually. They offer different types of modems like D-Link, Huawei, Utstar, TKD etc.. for their customers. Though they are from different manufacturers, configuration steps are similar. This tutorial explains how to reset MTNL Modem, reconfigure MTNL modem, setup wireless and WiFi security on MTNL Wireless Modem, troubleshoot slower broadband internet connection etc. We have provided detailed steps valid for most of the modem models MTNL Broadband usually supply to customers. Here let us check how to configure different models of DSL modems like Huawei, D-Link, Utstar, etc .. with Mahanagar Telephone Nigam Limited broadband service. 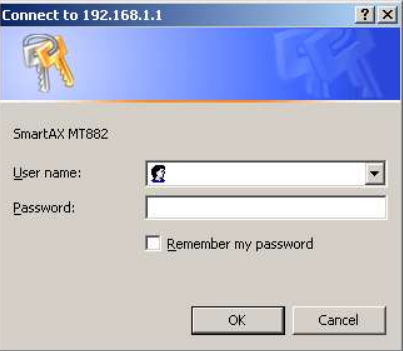 Login IP address of MTNL modem is 192.168.1.1 and use the following username and password to access setup page. You might see a different user interface for different modems. The process is similar for every model and the values of VCI, VPI, PPPoE username, and password, etc.. are same. 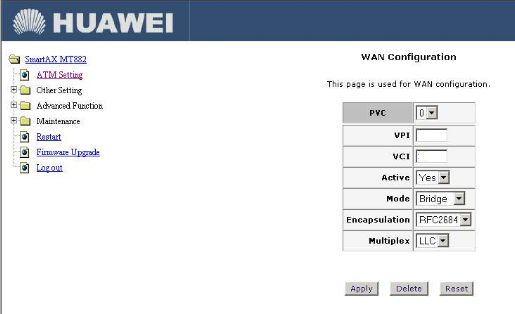 If you have a Huawei modem, you may see the following setup page. Here we need to enter the following values. We must select the mode as routing to enter the MTNL username and password. Usually, we must enter the telephone number as username and Subscriber number as password if MTNL has not provided another value. We must make sure the default route under IP address is enabled. You must select the encapsulation as PPPoE. After verifying the details you must click the Apply button at the bottom of the page. Restart by pressing restart link on the left-hand side menu. You must choose the option to restart now with current settings. If you have D-Link modem, you might see a different setup page. 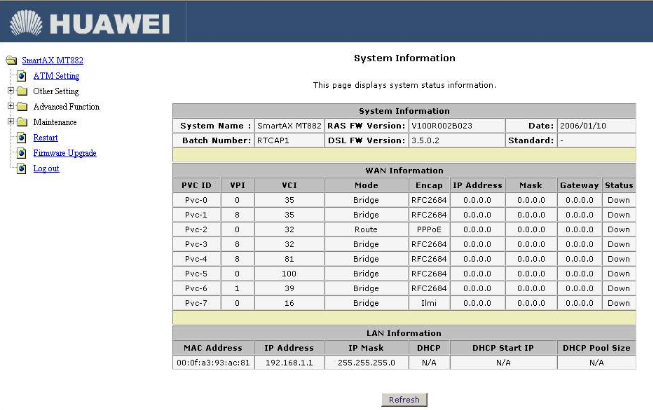 Look at the picture below and to configure broadband, click WAN button on the left hand menu. Use the same information I have provided above to configure D-Link modem with MTNL broadband connection. You may use the username and password provided by MTNL or use the telephone number as username and subscriber number as password to establish PPPoE connection. Click on Tools button on the top menu and then click System button. Now to restart the device, click on save and reboot button under Save Settings. Another popular modem brand provided by Mahanagar Telephone Nigam Limited is UT-Starcom. They have different models like UT-300R2U with routing feature. The values to configure are same and the procedure to set up UT-300R2U is provided below. Now enter the details as provided above. 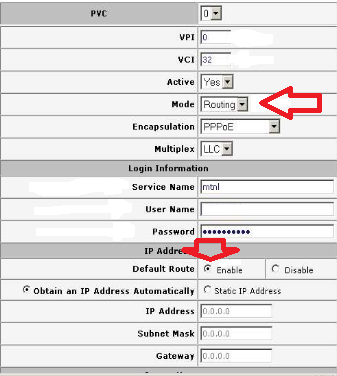 Connection type must be PPPoE LLC and make sure Network Address Translation (NAT) is enabled. After entering the details, click Apply to save settings. Click Tools on the top menu and click Misc button. Now you can see the Save & Reboot button. If you are using the WiFi feature, it is important to enable WiFi protection to block unauthorized users. This guide explains how to set wireless encryption on modems supplied by Mahanagar Telephone Nigam Limited. You can follow the same steps on every models provided by them. You can change the SSID, WiFi broadcast status etc from this window. If you do not want public broadcasting of your wireless network name, you may select no button at Broadcast SSID. At SSID, you can change the name of the wireless network. 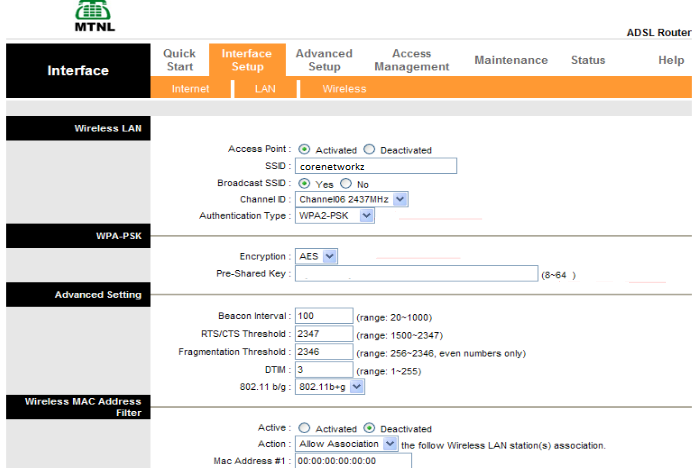 Select the right authentication for the wireless connection from authentication drop down menu. I recommend you to select WPA2 from the drop down menu because it is the most reliable WiFi encryption available for MTNL WiFi network. You must enter a passphrase at Pre-Shared key which is known to you only. You can prevent certain computers from accessing the network even if they know the pre-shared key you set. It can be done by blacklisting MAC address of those devices. Another option is to allow access to certain computers only by whitelisting MAC address of those devices. You can perform it on MTNL modem under Wireless MAC Address Filter option. See the image below to get more idea about it. If your computer is showing connection troubles with MTNL WiFi network, you may check whether the MAC address of your device is blacklisted in the modem under Wireless MAC Address Filter. There are two different procedures to reset MTNL modem. They are soft reset and hard reset. 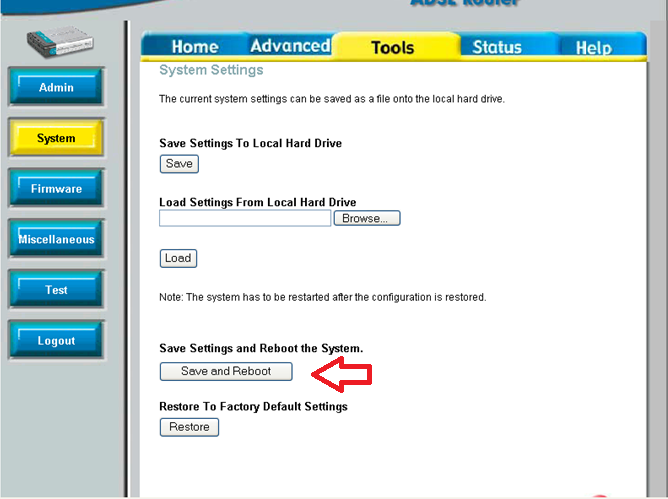 To soft reset MTNL modem, you must click the Restore button under Tools/System menu options. 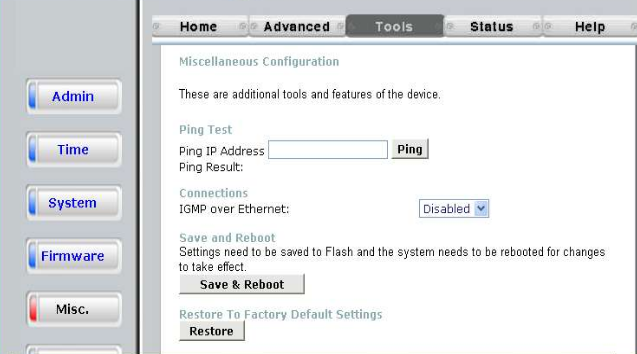 For the step by step instructions to reset and reconfigure MTNL modem, visit the link below. in case if you feel you are not able to download or upload with MTNL broadband connection at the speed you pay for, follow the instructions provided below. If you forgot the admin password of your MTNL wireless modem password, follow the steps below. If you are facing any connectivity issues, first you should check the status of the link light. If your line is connected well and the modem is receiving an Internet connection, it must be green. If your net connection is down and the MTNL link light is green, maybe you must check your local network (especially if you have a router). I recommend you to follow the instructions provided in the link below. Thank you for this post. You helped me save my time and energy from calling mtnl customer support for changing wireless name. Me and my neighbor having same name set on wireless and it made difficulty for both our family.